» Happy new year! Normal service is resuming. 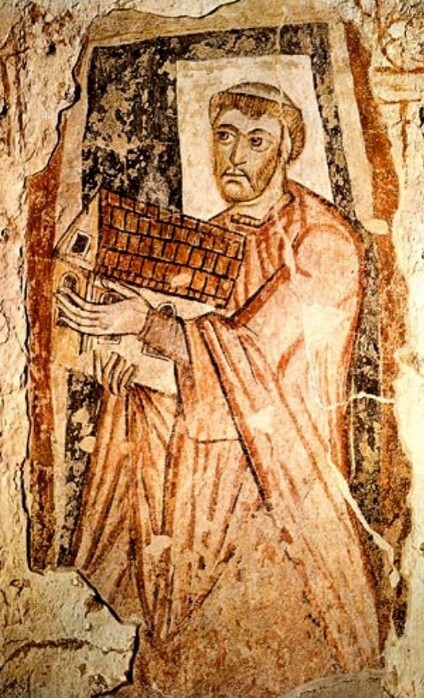 » Yesterday was the feast of St Benet (ie Benedict) Biscop, and in former times this marked the end of the monastic in-house holiday. St Benet is the other principal patron of the EBC, along with St Augustine of Canterbury. St Benet, a Northumbrian, is largely unknown to the bulk of Catholics today in England. He died in 690, having established Benedictine life in Monkwearmouth. He was St Bede's abbot. More importantly he intended his monastic foundation to be a model monastery for England. He drew on his close links with Rome to import books to build a monastic library. Just as significant were his principal human imports: John the Cantor from Rome to teach the monks to chant according to the established practice of Rome, as well as both masons and glaziers from what is now France, allowing the (then) novelty in England of a stone-built church with glass windows. St Benet felt nothing but the best that could be managed was fitting for the worship of God. How well we monks of the EBC today live up to St Benet's vision is for others to judge. In his honour we had a talking lunch with wine. » Preparations for the repairs of the abbey church proceed, with the loss adjustors having visited this past week and various experts, including Greg Primavesi, our clerk of works, drawing up reports and suggested plans of action to consider. Once all the quotations are in and we hear exactly how much the insurers will cover we can move ahead. One thing is clear: this will be expensive as there is more involved than merely the replacement of a few panes of glass. All the windows in the clerestory have been discovered to be vulnerable, some already teetering on the brink of collapse. We are taking advantage of the closure to fix the perennial problem of leaks in the 1993 nave. We also intend to address, if we can, the other perennial problem of the 1993 church: cluster flies. The community is very grateful for the several people who have spontaneously sent in donations towards the costs. While we are seeking out grants from relevant trusts, it may be that the community has to draw down from the investments it relies on to cover our operating deficit. We may have to launch an appeal. We will know more soon. For now, we are not committing to reopening the abbey church nave to use before Easter. Our Sunday Mass will continue to be held in St Mary's for now. » Like London buses, trouble comes in threes. In the kitchen one of the ovens broke down during the week, though thankfully it can be repaired. Yesterday we discovered that the other oven is showing signs of imminent failure. We are praying it, too, can be fixed; commercial ovens do not come cheap. In the monk's laundry the tumble-dryer decided to spin without heat, though this also requires only a new part and not complete replacement. » The decluttered reception area has been completed with the making of a cushion for the pew by our seamstress Sally, affording visitors seating more comfortable than the concrete slabs by the main door. » Tomorrow Fr Boniface returns to Ormskirk after many weeks recuperation here at Douai.